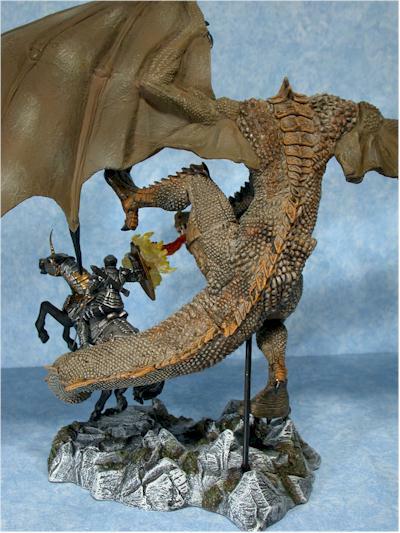 Dragons are nothing new - I know collectors who have been focusing on them for over a decade, and I'm sure there are folks that go way back before that. 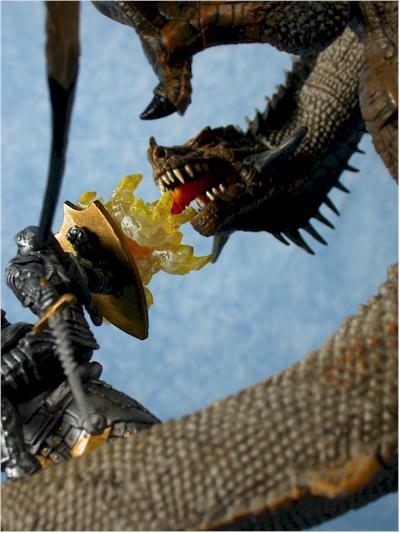 True, there haven't been many dragon ACTION FIGURES, but dragon statues, toys and dioramas have never been in short supply. Hey, they're almost as popular as cute pigs and ceramic babies. 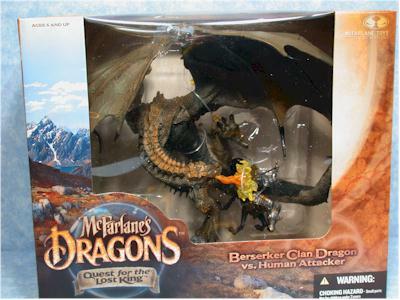 Mcfarlane Toys picked up on this theme with their new line called Dragons: Quest for the Lost King. I didn't realize Elvis was lost, but perhaps it's a way for them to tie the two lines together. The line includes five individual dragons, each based on various 'clans' - Eternal Clan, Fire Clan, Water Clan, Komodo Clan and Sorcerer's Clan. 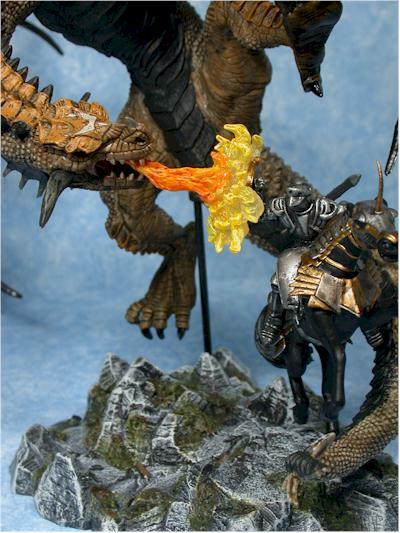 There is also a deluxe boxed set - reviewed tonight - of the Berserker Clan Dragon going up against a human attacker. The set retails for about twenty bucks, and should be hitting stores in the next couple weeks. As always, I have some suggestions and sponsors who are carrying the line, all for great prices. With most Mcfarlane figures, we're used to the clamshells. But the deluxe figures are always so big, they require boxes. This is one of those boxes that looks terrific. The figures are laid out inside in battle (although not in their exact positions once freed from the plastic prison), and the box graphics fit the diorama positioning nicely. The box sports excellent earth tone colors, and takes advantage of the type of fonts and style you'd see at just about any renaissance fair. They aren't super sturdy, and you can crinkle up the window if you try hard enough. They aren't collector friendly either, and you'll have plenty of twisties to remove. But they look sharp, and do 95% of what they should. These are Mcfarlane toys - do you really expect poor sculpts? However, there has been one overriding discussion on this line...scale. Many folks have commented that these are too small, or are surprised by their size. I'm not sure how much larger they could be though, and still sell for the usual boxed set kind of price. 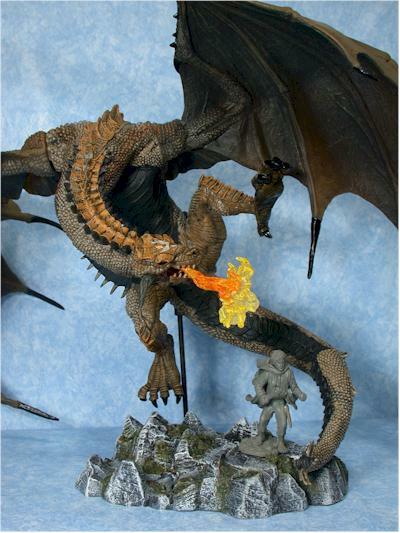 The dragons wingspan is about 12", and he's in scale with a human that's about 3" tall. I included a shot with the super articulated Spawn and Mattel Batman at the end of the review to give you some idea, and perhaps it's because this deluxe set has both the human knight AND the completely opened wings, that it seems to be larger than I had expected. No, this is not the size of the Alien Queen, for example, but the price point would be much higher if they were. The detail work on the dragon itself is exactly as you'd expect. Tons of work went into the scales, spiny back, and plated underbelly, and the leathery appearance of the wings is completely different than the rough texture of the skin. Without too much articulation, the pose is critical, and this one works great. 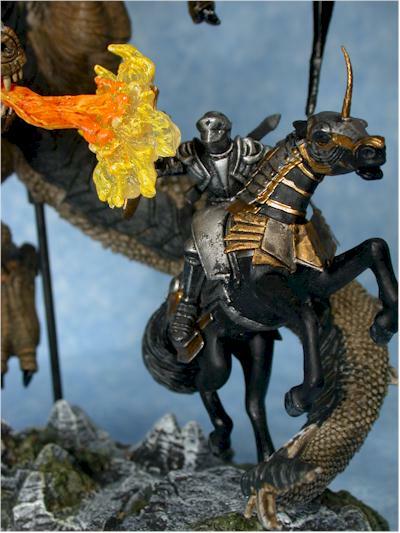 The knight is protecting himself from the dragon's fiery attack, both posed over a rocky base. The base includes mossy grass, and the effect looks great. The one feature that both impresses me the most and disappoints me the most is the fire. It breaks against the shield perfectly, and I'm really impressed with the sculpt and paint. They managed to pull off something very difficult, and make a dynamic element like flame look realistic. Until you get to the disappointing part, that is. No matter how I tried, and I tried, believe me, there was no way to get the dragon, knight and flames to line up properly. The flames were always slightly off to the left side of the mouth, and with the post for the dragon, post for the knight, and post to connect the flames to the shield all in specific spots, there was no way to adjust it easily. Still, that's not enough to take off much in the sculpt department, and while the entire dragon line isn't perfect, I think the boxed set stands out as an excellent set. I noticed that there was a slight departure on the paint ops with this figure - it seems to me that there is far less dependency on paint washes to highlight detail. Oh sure, there's still some, but they aren't slopped on as heavy as we've seen in the past from either Mcfarlane or any of the other companies currently doing highly detailed sculpts. Instead, there's just enough to show off the differing textures, without going overboard. That's a nice happy medium between too much and too little, and this line in general sports more unique and interesting colors than some past themed lines. Rather than five or six predominately green or brown dragons, each has a very unique paint job, and the work on the Berserker is quite clean and neat. The colors here are also very dragon-like, in the traditional sense of the medieval dragon, rather than the wilder appearance of the Far Eastern dragon. I've already mentioned how great the paint work is on the base, and the style has a very English moor feel to it. If there's one area where the paint is a little weak, it would be on the knight and his horse. There's good use of color, but there is a little more slop here in the detail work, especially on both the rider and ridee's armor. It's not a huge issue, but worth noting, so that you can keep an eye out for it and find the best possible on the shelf. 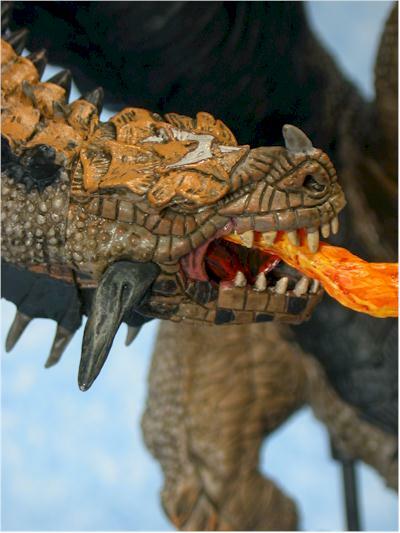 If you're expecting a lot of articulation in your fire breathing monsters, then this line is not for you. The dragon has eight points of articulation - one at the start of the neck, one at the end (right at the head), the left hip and ankle, the right knee and ankle, and two in the tail. These are all cut joints. You can get the various appendages in just the right spot, and leave it there. The knight actually has articulation as well, including his neck, his shoulders, and the horse's neck. Again, it's not enough to do a whole lot beyond getting them in the one perfect pose. If you consider these a set of two figures, than the only real accessory is the display base. It's very well done, as I mentioned earlier, but it's still a tad light. I'm not going to complain too much though, because it contributes to a lower price and better value later in the review. This isn't a toy designed for play - it's intended to sit on the shelf and look good. That's what it does well, but it's not a ton of fun. 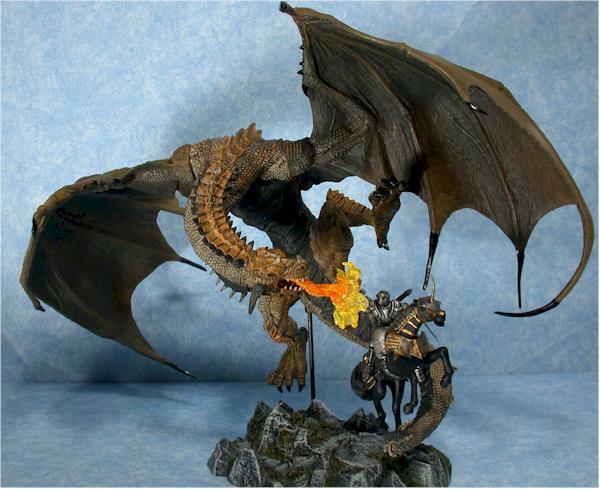 Older kids might like it though if they have a thing for dragons, knights and medieval times. I almost bumped this another half star, since at twenty bucks it's definitely a good value. I was right on the cusp, so if you manage to pick this up for anything under $20, you can certainly add another half star. 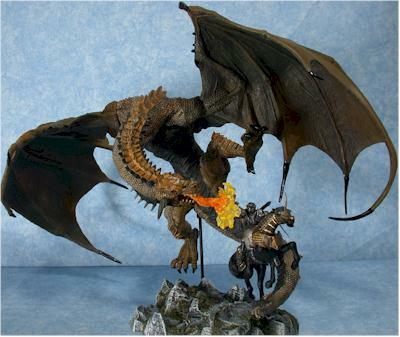 The idea of dragons for a line was an excellent one, not because it's innovative or unique - the only thing more popular than pewter dragon statues is ceramic pigs in cutesy poses - but that there was a gap when it came to high quality plastic versions. The theme fits in nicely with other themes that are common to Mcfarlane, and they wisely avoided doing anything twisted or tortured with the line. Of the entire set, the Berserker with his human attacker is easily my favorite, with the extremely dynamic pose, and outstretched wings giving the set a greater impression of size than the single figures. The Berserker also looks more like a traditional dragon to me, and less like a lizard with wings. The combination of colors works in that regard as well, and while I'll admit I would have loved a larger scale, I can see why they went with this size to keep the price point in relation to their other lines. However, I'm giving this score based on sculpt and paint - not articulation and accessories. I've weighted the first two much higher in this case, because I understood going in that those are the areas they were shooting for, and judging them based on it. Your mileage may vary, and that's why the areas are graded separately. If you're looking for articulation, you'll weigh that heavy in your overall, and have a lower score than I.
Zippo. There was no real risk of breakage, and everything fit together easily. When picking one out though, try to find one with the best ball of fire you can. 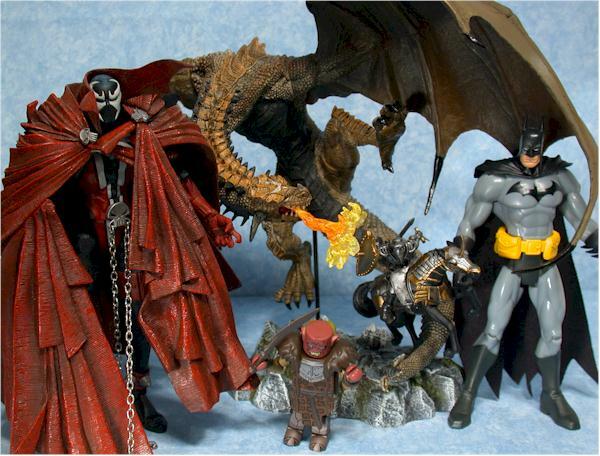 - Clark Toys has a the individual figures at $10 each, or a full set of five for just $45. If you're looking for a set, that's an excellent price. - Action-HQ is a little higher at $14 each, but they tend to get their figures in sooner than other retailers, since they are in Japan. - Killer Toys has the individual figures for $10 - $13 depending on the figure, or the set of five for $49.